Gordon Eddison. B Ed (Hons). L Mus LSM. NABBC. Gordon is a product of the Hammonds Sauce Works Bands. Having started playing Bass aged 11 in the Junior band whilst being taught by the great Geoff Whitham. A short spell with the Haworth Band (and a 3rd Section National Title) followed before moving to The Band of Yorkshire Imperial Metals aged 16 under another of Gordon’s heroes Trevor Walmsley DFC. He feels fortunate to have joined this great band during it’s most successful period with Regional, National and British Open wins. A career in the Police forced a move away from banding for a short while. He returned to Hammonds Sauce Works in 1987 under Richard Evans and Geoff Whitham. Spells at Yorkshire Building Society, Carlton Main Frickley Colliery and Yorkshire Imperial Bands followed. Gordon started conducting in his twenties when he formed the Junior band to the Hammonds Junior Band. The band grew from a learners group to competing in the Yorkshire 4th Section Regional Championships. Several of the players from that band are now playing in top bands across the region. After retirement from the Police Service twelve years ago, Gordon was invited to join the Leeds Music Service as a brass instrumental teacher. This included becoming conductor of the Leeds Schools Junior Brass Band which then had 9 regular players. Two years later, the band of 45 players competed in the National Youth Brass Band Championships and enjoyed the first of two successive podium finishes against bands from all over Britain. Gordon became MD of Otley Band in 2007 and an enjoyable period of nearly six years with the band produced two section wins at the famous Hardraw Scar Contest; “Outstanding Performance” prizes at competitive music festivals; two CD recordings and several television appearances – not forgetting attracting a sizeable and loyal audience whenever it performed. 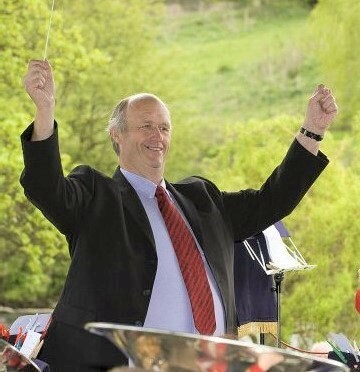 Pressure of workload and the wish to develop Wharfe Brass and ‘Stepping Stones” (Junior Band to Wharfe Brass) prompted Gordon to retire from Otley Band in 2012. Gordon also conducts bands on a freelance basis and is a member of The National Association of Brass Band Conductors. Gordon was the full-time MD of York Railway Institute Band, whom he conducted for five successful years. Their partnership resulted in qualification for the National Finals each successive year with North of England Titles and winning the Northern Open Championships. The band won promotion from the Third Section through to the first. Gordon has a wealth of experience conducting bands in every level of banding and of all abilities. He admits to getting his best ‘buzz’ working with young players. Gordon is married to Sheila (they met while playing in the Hammonds Junior Band 42 years ago!) who is a cornet player and teacher of music. They have two sons; Chris is an electronics and radar engineer for the day job and a much sought-after sound engineer in Yorkshire theatres when not at work, and Dan who is one of the country’s top young trombonists, having left the Brighouse and Rastrick Band to study trombone at The Royal Conservatoire of Scotland, where he graduated in 2016 with an Honours Degree in Performance. He is currently studying for his ‘Master’s’. Gordon’s motto – “Don’t just play notes – use them”. Comment on taking over the role as MD of Silsden Band – “When I heard this long-established band was struggling to recruit a conductor and were in danger of folding, what could I do? A band full of such lovely, keen folk that has such a long history. I am really looking forward to us all having a good time making music”. The present band was re-formed in 1990 to promote brass band music in the town. Over the years, the band has seen many changes in members and our numbers have varied over the years with youngsters going to University and older members taking a well-earned break. Many Thanks to Sylvia Somers who has kept the band together in recent times taking over as Musical Director. Without her expertise the band would have surely folded, but her real love is playing and now with the appointment of our new Musical Director, Gordon Eddison, Sylvia can resume her position of Principal Horn, which is just one of the many instruments in her repertoire. The band currently has the luxury of being able to call upon over 20 playing members and is lucky enough to be able to call upon invited guests if the need arises. All bands are only as successful as their members enthusiasm allows them to be. If our music matched our enthusiasm we would be a championship band…..watch this space! Members range in age from teenagers to octogenarians and we pride ourselves in being a friendly group whose main aim is to enjoy our music. Any new players of any standard will always receive a warm welcome. The band is guided by a Committee of five members with a Chairman, Secretary, and Treasurer. Formality is kept to a minimum and the Committees primary function is to ensure the smooth running of the business part of running a band. The band play concerts, galas, weddings and church services and are happy to consider other functions in the locality. We play in Silsden, Addingham, Skipton, Ilkley, Keighley and surrounding areas including any special requests for other venues. We usually entertain a full summer programme and we are always busy at Christmas playing carol concerts which, each year allows us to make donations to various charities. If you can assist please contact Phil or come along to our band night.